THE DISTORTION THEORY: “RUSSIAN PILOT” DURING UFO WAVE OF 1954 DISTORTS OUR “REALITY”? “RUSSIAN PILOT” DURING UFO WAVE OF 1954 DISTORTS OUR “REALITY”? At the height of UFO wave in France in 1954, an alleged Russian pilot produced one of the strangest and disturbing incidents on French territory. It happened on October 20, 1954, in l'Etape Raon (Vosges). 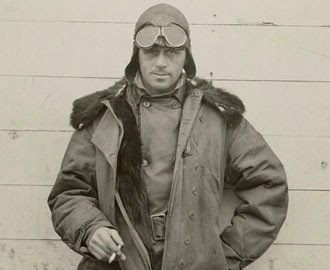 Lazlo Ujvari, of Czechoslovakian origin and a former Legionnaire, was going to his workplace, at a company, from his farm in Deray in "Le La," riding a bicycle until bad road conditions forced him to walk. Lazlo Ujvari undoubtedly protagonist of one of the most bizarre and puzzling UFO close encounters . His experience was framed inside the famous UFO wave that shook France in 1954. It was about 2:30 in the morning. Suddenly in the middle of the road, a man with a gun in his hand, emerged from the shadows of the forest, and signalled Lazlo to stop. This was a normal looking person, corpulent, 1'65 meters tall, wearing a cloth cap with earflaps (helmet? ), an open-necked blouse, leather-wrapped, cloth trousers and boots. The witness is intimidated by the gun but not really scared; he had been in the military. The gun-man talked but Lazlo Ujvari could not understand the language even though the man continued to talk. Then Lazlo spoke Russian (he spoke several languages) and the stranger understood. The gun-man asked Lazlo several questions: "Where am I? Spain or Italy?" When he discovered he was in France, he asked, "How many kilometres to the German frontier?" Lazlo replied that "it is 100 km to the Rhine in a straight line." Then the gun-man asked the time, and Lazlo said 2:30. The gun-man pulled out a pocket watch and replied: "You lie. It is 4." (Moscow would have had 3 hours more). The "absurd" interrogation continued. How far away and in what direction is Marseille? (Apparently mispronouncing the city and perhaps referring to elsewhere). The dialogue stopped and the mysterious individual, never without his gun, asked Lazlo Ujvari to walk forward. On one side of the road, Lazlo vaguely observed a dark object that seemed, at first to be a car or van. But the closer he got, he realized that it was a great object of about 6 meters in diameter and 3 feet high, composed of two superimposed plates, dark gray, with a dome on top. Also on the top was an antenna in the form of a "corkscrew." The strange artifact observed Mr. Ujvari. In its top part, the witness said that had an "antenna" as a "corkscrew"
Lazlo was not stopped by the "Russian pilot" who still intimidated him with his pistol. They walked about 30 meters more, and then the pilot said, “And now Farewell.” Ujvari mounted his bike and rode for about 200 meters to near the entrance of the village where he stopped. He then observed a very strong vertical light emerging from the forest, and heard a noise like a "sewing machine" or a whistle. Then the device rose up, with no lights and after ascending vertically went away, diagonally. Ujvari was later questioned by the police who did not find fault with his testimony. 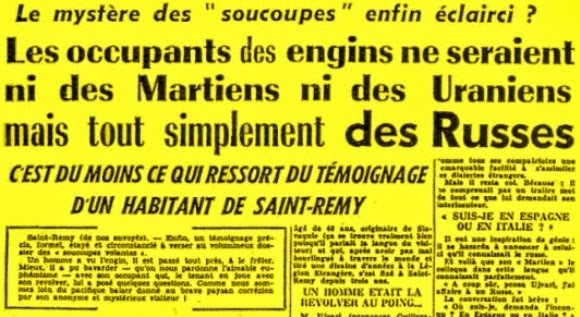 Some researchers, like Michel Corrouges (Martians Appear 1963), believes that we "can not rule out the hypothesis of a lost Russian helicopter" although the witness did not recall seeing propellers and the object did not seem to fit the description of a helicopter. It is very strange that when landing, the missing Russian pilot, had the luck to find a Frenchman in a small region (approximately 7,000 inhabitants), who spoke Russian. And we also have the unexplained anomalous language used by the supposed "Russian pilot" that could not be understood by the witness despite knowing several languages.